10/10 Body Hack Team Building is training the Brain while accomplishing Intelligent Fitness Activities. Facilitated by professionals that get your leaders, managers and staff to adapt – quickly. It’s time to test your teams. Building their resilience with team development training programs for leaders and staff that want more. Thrill supplies extraordinary experiences that change the way your staff think act and be trained in business. It’s time not just to observe professionals and experts in their arena. But to meet them; emulate their skills, practice performance enhancing techniques and become them. 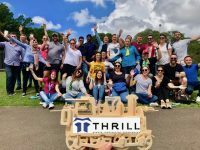 Thrill is on a quest to bring the science of human potential with mind hacks and body hacking to teams to achieve more and beyond their current limited levels. We collaborate with you in custom designing Body Hack activities, Unique Training Events. Conference Breaks and Mind Training for all businesses and groups across Sydney, Melbourne, Brisbane, The Gold Coast and Canberra. It’s time to change and participate in corporate events that engage and inspire people. Speak with us to design the changes you are aiming at. Remember Todd Sampsons Body Hack series. If not, that’s fine – here’s a refresher! Let us teach you and master the mind tricks to re-engage the mid to learn, retain and recall information that you have absorbed. More readily, more accurately and more efficiently. Understand the problems now Focus on Solutions. Being effective at work. It’s not about working harder. It is about utilising the available time. As life is too short. We need to make the most of our assets. Your people and their talents. Tapping the potential of employees and training the brain whilst improving the bodies fitness. You can body hack too. Combining a series of unique and new team building activities and ideas formulated from games, puzzles, science, human survival. Art and fun play into a series of challenges that will put your staff in the drivers seat. Break out of assumptions – challenging their own locus of control. Immerse yourselves in the life of a Fire Fighter training. Co Pilot aero planes, helicopters or experience Flight simulations and Simulators. Speak with Konrad Lippmann director of Thrill team training BA Human Movement + Graduate Diploma of Education; solutions focused to kick start your corporate teams Body Hack Challenge. Or have Todd Sampson, professional speaker train and engage your staff at your next conference, corporate event, meeting, off-site planning session, AGM, end of financial year EOFY event or leadership training session. Now is the time to call: 02 9630 2222 and start focusing on the results.